You gots questions? We gots answers! -24 Hour access to HUNDREDS of video lessons, all complete with downloadable sheet music. Topics range from world rhythms, linear studies, basic skills such as how to hold the sticks, song covers, and TONS more. There are lessons suited for every beginner, intermediate, and advanced player. Each lesson is color coded to let you know the difficulty level. -A series of 3 lesson tracks just for the beginner (that’s 24 lessons!). I know that when I start something new, I can get overwhelmed. We try to keep that from happening. -Access to the live streaming lessons. This is where you get to interact with me. There are several new live lessons every month. Check out the SCHEDULE here. There is a chat board attached to the lesson so you can hang with the other students and discuss the lesson. Each lesson ends with a live Q&A time. Questions can be on ANY topic and I stay live until every question has been answered. – 20-30 minute practice breakout sessions with most new lessons. I teach you how to methodically go through your practice time and apply the material you are learning. -Access to the student YouTube channel. Students upload videos to this channel of their progress, band performances, or for my review. -We absolutely KILL organization. You get access to over 60 student tracks (each track has 8 lessons in it). Each track is topic specific and will take you through a series of lessons on a specific topic. Wanna learn the mambo? We’ve got you covered. Beginner? Bam…go through the beginner track. Wanna go linear? You’re in luck. Each week of your track has bonus downloadable lesson resources to help you see daily growth in your playing. -Patented A.D.D. assessment method to help you know where to start. And if you still have questions, just send us your filled out A.D.D. worksheet and we’ll tell you exactly what you should be working on! -Access to tons of song cover breakdowns complete with full charts of the drum parts. -Playalongs recorded by professional musicians right here in Music City, USA. -Each lesson also comes with assessment criteria. The goal is for you to be confident that you are learning the skills needed to master each lesson. If you sign up for a monthly membership, your account will be debited every 30 days in the amount of $28. If you sign up for a quarterly membership, your account will be debited every 3 months (90 days) in the amount of $78. If you sign up for the 6 month membership, your account will be debited once every 6 months (180 days) in the amount of $145. If you sign up for the yearly membership, your account will be debited once a year (365 days) in the amount of $249. How do the live lessons work? The live lessons are the interactive part of The Shed. It’s exactly what it sounds like…a streaming live drum lesson. Nothing is pre-recorded. It’s all very live and very interactive. Stephen teaches a lesson (45-60 minutes) and then allows plenty of time at the end of the lesson for questions via the chat board. Each live lesson also comes with a PDF download of the exercises. All practice breakout sessions last approximately 30 minutes. What if I miss a live lesson? Missing a lesson isn’t a problem in the least. The main focus of a subscription is the 24 hour access to the incredible amount of organized video lessons and sheet music (and there are hundreds of them). We assume most students can’t make all of the live times…and some never attend a live lesson altogether. If you miss a lesson, that lesson will be available for you to watch AS MANY TIMES AS YOU WANT in the members area. It typically takes 1-2 days for a live lesson to post in the members area. You can then review the lesson and come to the next live lesson prepared to KILL it! That’s all great…but I can’t read music!!! Not a problem. Upon signing up for the lessons, you’ll find a lesson track dedicated to teaching you the basics of reading music. Stephen will take you through the process step by step so that you can get the most out of your time in The Shed. Reading music isn’t hard…and we’ll prove it to you. What makes your lessons different than other lessons on the internet? Good question. In short, ORGANIZATION, goal setting, and access to a personable teacher. We put you on a lesson track on the topic you need to work on, give you video lessons and sheet music, help you organize your goals, and provide you with additional lesson resources to help you achieve daily progress. Stephen answers all of his own email from the students. No hired guns touch them. He takes your drum education as seriously as he takes his own. Personal contact with a teacher is so very important. We also love organization. I am constantly improving and refining how the lessons are delivered, how the content is presented, and how things are organized. We want your education to be specific, personal, and goal oriented. Stephens Drum Shed accepts all major credit cards, debit cards, and PayPal. What makes Stephen qualified to teach me? Stephen has over 15 years of professional gigging experience. Read about his career here. I don’t have a high speed internet connection…can I still view the lessons? We know that many people across the world (yes…Stephens Drum Shed has students from the Netherlands, Australia, Canada, Spain, North America, South America, Hong Kong, Thailand, Germany, the UK…the list could go on for quite a while) do not have access to quality high speed internet. All of the lessons in The Vault are offered in standard definition. Every lesson recorded after January 2013 is offered in standard definition as well as hi-definition. Can we contact Stephen with questions? Abso-frickin-lutely! That’s the whole reason he’s here…to help you become the best “you” on the drums that you can be. Don’t hesitate one second to shoot him a line. He answer each and every one of them. Simple…just email us at help@stephensdrumshed.com or call the studio directly toll free at 1-888-336-3111 and your account will be cancelled promptly. I don’t have Skype. Can I still view the Live Lessons? You don’t need Skype to view the live lesson content. The Live Lessons are streamed to you and you watch them like you would watch any You Tube video. My screen froze in the Live Lessons…what do I do? Try simply refreshing the page. This fixes the issue 99% of the time. Can I view the lessons on my mobile device? Yes. Anytime, anywhere, on any device. Sure! Cancel within the first 14 days of signing up and you will receive a full refund, no questions asked. Beyond the 14 day trial period, all charges are final. 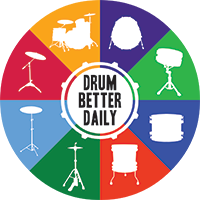 FREE Drum Lesson Download: "30 Days To Better Doubles 2.0"